Shining above crystal clear turquoise waters, Dove Creek Lodge is an intimate island style boutique hotel in Key Largo, Florida that you can call your very own. Dove Creek Lodge is an intimate island-style boutique hotel you can call your own. Warm. Friendly. Uncomplicated. And perfectly personal. Your definition of paradise. Start your adventure in Key Largo at the center of some of the best fishing on earth. Bonefish, tarpon, permit, sailfish and more all swim in our nearby waters. Good food, comfortable lodging and experienced guides make for the perfect Keys fishing trip. Step through our doors and see what we're all about. Fishing in the Florida Keys at Dove Creek Lodge IN AND OFFSHORE | GUIDES | WHAT TO PACK - FLYING W/ TACKLE | FISHING REPORT TOURNAMENTS | DIVING AND SNORKELING | FISHING CALENDAR | REGULATIONS The fresh salt spray hits your face as you ply the ocean waters in early-morning serenity. The sun rises and your spirits follow, as you set off for a thrilling day in the fabled Sport Fishing Capital of the World - the Florida Keys. A member of the International Game Fish Association, Dove Creek Lodge in Key Largo offers experienced guides and captains, as well as deep-sea fishing charters at your disposal. Your quarry is as varied as the colors of the ocean - sailfish, dolphin (mahi-mahi), tuna, wahoo, king mackerel - and the legendary blue marlin. If you prefer backcountry fishing, our guides will prepare you for a relaxing expedition to Everglades National Park in search of bonefish, tarpon, snook and redfish. They'll assist you with fly-tying, and even give you a complimentary casting lesson at the dock. No detail is ever overlooked. Our Concierge Service Staff will assist you with anything you need, such as airport transportation, boxed lunches aboard and more. We'll even deliver your catch to the chef at Snapper's restaurant for dinner that evening. The perfect end to a memorable day. Dining and Entertainment at Dove Creek Lodge, Key Largo, Florida Check out Snapper's Menu -- Dining -- Dove Creek Lodge sits next to Snapper's Waterfront Saloon and Restaurant, home of the famous Turtle Club (a locals' favorite) with live entertainment. 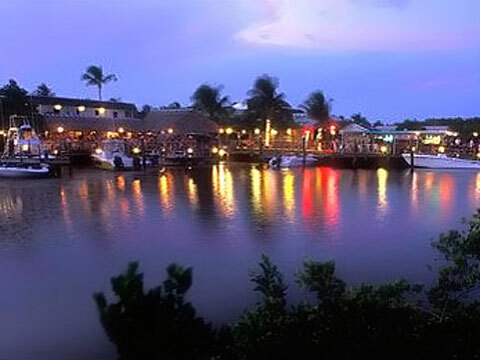 Snapper's features one of Key Largo's best waterfront dining experiences. Their seafood is so fresh they print menu inserts each day because they don't know what's coming to the dock. And all their fish is filleted on the premises. Their sauces are made daily from scratch as are their chowders and soups. All deep fried items are hand breaded.The steaks and grilled fish are prepared on a charcoal grill. They take pride in using only the freshest ingredients for all their Old Florida and Caribbean seafood dishes. Read what The Reporter has to say: "A treat for taste buds craving all entrees harvested from the sea and land." Contact Snapper's if you have any questions about them or their menu at (305) 852-5956. We would be happy to make a reservation for you. They serve lunch and dinner daily and a Sunday Brunch from 10am-2pm. http://snapperskeylargo.com -- Entertainment -- Eco tours We can organize informative tours of the backcountry and Everglades as well as the local Keys. All kinds of wildlife swim and fly in this area - everything from manatees and dolphins to herons and ospreys. Family fun There are lots of fun things for the whole family to do: Sailing, parasailing, swimming, feeding the local tarpon, swimming with the dolphins, airboat rides and kayaking are just a few. Or just relax by our pool. Golfing If golf is your game we can arrange a tee time at Keys Gate Golf and Tennis Club a mere 35 minute drive from the lodge. Or if you prefer a scenic tour, take the drive to the Key West Golf Club, 94.5 miles to the south. Say "I do" in an orchid-draped gazebo, set against the dazzling blue ocean waters and a breathtaking island sunset. Sashay across a clear dance floor atop a dramatically lit pool. Toast your future at an exquisitely adorned table under swaying palms. Your wedding at Dove Creek Lodge is all this, and more. An unforgettable celebration with family and friends in a spectacular island paradise. Whether you prefer a casual, barefoot-in-the-sand bash, or a grand affair that pulls out all the stops, we can help make the planning virtually stress-free. It's just our style. Our Wedding Concierge Service is your helping hand, advising you on everything from securing your marriage license to arranging for the sounds of a steel drum band. We'll help you make your wedding as magical as the love you share. The fresh salt spray hits your face as you ply the ocean waters in early-morning serenity. The sun rises and your spirits follow, as you set off for a thrilling day in the fabled Sport Fishing Capital of the World - the Florida Keys. A member of the International Game Fish Association, Dove Creek Lodge in Key Largo offers experienced guides and captains, as well as deep-sea fishing charters at your disposal. Your quarry is as varied as the colors of the ocean - sailfish, dolphin (mahi-mahi), tuna, wahoo, king mackerel - and the legendary blue marlin. If you prefer backcountry fishing, our guides will prepare you for a relaxing expedition to Everglades National Park in search of bonefish, tarpon, snook and redfish. They'll assist you with fly-tying, and even give you a complimentary casting lesson at the dock. No detail is ever overlooked. Our Concierge Service Staff will assist you with anything you need, such as airport transportation, boxed lunches aboard and more. We'll even deliver your catch to the chef at Snapper's restaurant for dinner that evening. The perfect end to a memorable day.